Thank you for your entries, everyone! This giveaway was a huge success with 401 entries all together. Congratulations, 3 Giggly Monsters! You've won a $35 CSN Stores GC. I've emailed you, please reply within 48 hours or a new winner will be drawn. 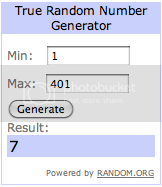 I drew from comment 1 to comment 401, and the random number drawn was 7. Thank you so much for everyone's support and participation!